In a tiny display in New Zealand’s Te Papa Museum “Awesome Forces” exhibit, a small plaque is dedicated to the “Dragon Lady,” Joan Pederson Wiffen (1922-2009). The size of this plaque belies Wiffen’s popularity in New Zealand. She is the nation’s fossil heroine, celebrated in textbooks and popular science websites alike. This tension between the small scientific establishment commemoration and her widespread public recognition parallels her own work as a scientist. 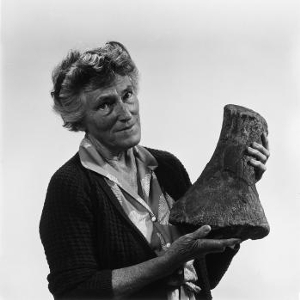 Although Wiffen is now one of New Zealand’s most celebrated paleontologists, many doubted her authority at the time of her most important discoveries. Wiffen experienced the prejudice against women scientists typical of the mid-20th century, amplified by the fact that she did not follow a traditional educational path to paleontology. Furthermore, paleontology itself was marginalized in New Zealand at the time. Many mid-20th century scientists thought New Zealand’s prehistoric land mass was too isolated to have fostered dinosaurs. Despite these significant obstacles, Wiffen pursued her interest in fossil-hunting and made some of New Zealand’s most important fossil discoveries. She taught herself to locate, dig up, and preserve fossils. Her independent approach meant that she was not limited by paleontologists’ traditional assumptions about New Zealand. Wiffen found fossils and jumpstarted paleontology in New Zealand because she operated outside of accepted expertise. Although Wiffen is now one of New Zealand’s most celebrated paleontologists, many doubted her authority at the time of her most important discoveries. Wiffen grew up in Hawke’s Bay, a rural coastal region on New Zealand’s northernmost island. As a child, she enjoyed collecting seashells, reading natural history books with her parents, and playing with mineral kits. Beyond her primary schooling, Wiffen received no formal training in the sciences. She, like her peers, was expected to marry and raise a family. And after serving in the Women’s Auxiliary Air Force during World War II, she did just that and married an electrician named Pont Wiffen. When Pont’s heart condition prevented him from attending the night school geology classes in which he had enrolled, Wiffen stepped in, and she loved it, especially the field trips. She collected minerals in her spare time and joined a local rock club. In her 1991 autobiography, Wiffen recalled, “It was the 1960s and science was in!” She pinpointed her particular fascination with fossils to a family vacation in Australia. In Queensland, she found a small trilobite and a Walsh River ammonite, and she was hooked. In an effort to remain close to Hawke’s Bay, Wiffen decided to search Te Hoe River Valley for fossils, a decision that itself reflected her unorthodox approach and observational skills. Using a map from an early oil survey of the region, she noticed a small note that said, “Reptilian bones” in the Te Hoe Valley. The professional paleontological community in New Zealand had long dismissed the possibility of vertebrate fossils in the area, but after months of searching the site to find the areas that corresponded with the map’s, Wiffen and her party found creek beds littered with shark teeth, scales, and vertebrae. This began Wiffen’s work in vertebrate paleontology in the “Valley of the Dragons,” or Mangahouanga Creek. During the 1970-90s, Joan and her party continued to collect fossil shells, teeth, and vertebrae in Mangahouanga. At first the collecting was done by Wiffen’s family and mineral collecting friends, but after her finds garnered attention, university students joined her expeditions. As their skill and familiarity with the site increased, they came across Plesiosaur and Mosasaur bones. Visiting paleontologists often recalled the skill with which Wiffen sped through the creek beds and found fossil laden rocks on her first try. In 1978, a complete plesiosaur skull was found, though it was not extracted from the rock until 1984. These marine fossils finds were significant and expanded the paleontological map of the Late Cretaceous Period to include New Zealand and Australia. Her discoveries and subsequent treatment highlight the double-edged nature of her outsider status. Her skill and finds were unmatched in New Zealand, but she was not allowed access to the proper channels for publication and credit. In 1974, Wiffen discovered a hollow bone unlike many of the marine fossils, which she studied for years. In 1979, an unintentional conversation with Ralph Monar revealed that she had discovered theropod fossils. Immediately, the two began making plans to present a paper about them at the Fifth Gondwana Symposium (1980) in Wellington. Monar gave the paper with Wiffen in the audience, even though it was Wiffen’s find. At the time in the scientific community, the discovery of dinosaurs was seen as unimportant because of the popularity of invertebrate paleontology. She should be admired for being able to traverse adverse terrain, quickly identify fossil sites, and process fossils in her backyard. However, this should not obscure the fact that those activities were only necessary because she was not given the opportunity to approach paleontology in the traditional way. At the end of the 20th century, with renewed interest in paleontology around the world, Wiffen’s work was revisited with new appreciation. In the 1990s, Wiffen named two new species of mosasaurs, which remain interesting to paleontologists because mosasaurs were thought to be a link between sea and land dinosaurs. A two-volume symposium on mosasaurs in the Bulletin de la Societe Geologique de France is dedicated to her. Ultimately, her work proved that dinosaurs once existed in New Zealand. This opened up new areas of paleontological research by effectively refuting the argument that dinosaurs had not moved across Gondwana prior the division of the supercontinent, which meant there might be numerous unexplored fossil sites around the world. In reading biopics and in memoriam essays about Joan Wiffen, it is easy to romanticize her experience, as many of her well-meaning peers do. She should be admired for being able to traverse adverse terrain, quickly identify fossil sites, and process fossils in her backyard. However, this should not obscure the fact that those activities were only necessary because she was not given the opportunity to approach paleontology in the traditional way. Wiffen herself did not learn from the same body of knowledge, circulate in the right scientific societies, or gain the respect of her peers prior to her major discoveries. Nonetheless she became a Commander, Order of the British Empire, won the Golf Medal of the New Zealand Geological Survey, and received the Society of Vertebrate’s Morris Skinner Award. Wiffen, the “Dragon Lady,” is deservedly heralded as one of New Zealand’s greatest paleontologists. John A. Long, Dinosaurs of Australia and New Zealand and Other Animals of the Mesozoic Era (Harvard University Press, 1998). Joan Wiffen, Valley of the Dragons: The Story of New Zealand’s Dinosaur Woman (Glenfield, New Zealand: Random Century, 1991).